Matthew Steinhoff will pedal 180 miles from Miami to Key Largo and back. In 2012, the Zimmerman MS Bike Ride raised nearly $1.4 million through corporate sponsorships and fundraising efforts of the cyclists, volunteers and donors. 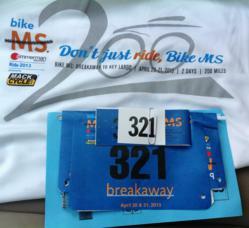 On April 20 and 21, 2013, the National Multiple Sclerosis Society’s South Florida Chapter will welcome more than 2,500 bicyclists for the 27th-annual Zimmerman MS Bike Ride, presented by Mack Cycle and Fitness. Among those riders: Matthew Steinhoff, project manager at Waterfront Properties and Club Communities. Voted the No. 1 bicycling event in the Sunshine State, the Zimmerman MS Bike Ride will depart the morning of April 20 from Florida International University’s Modesto A. Maidique Campus in Miami. Steinhoff and his On Your Mark team members plan to gather at 7 a.m. to suit up and start pedaling. The 100-mile route winds through neighborhoods of South Florida homes, down to Homestead and Florida City, and along Card Sound Road to Key Largo. The overnight stop is Ocean Properties’ Key Largo Village at mile marker 99. Upon arrival at Ocean Properties’ Key Largo Village, participants will celebrate in a festival-like atmosphere with food, fun and entertainment. The morning of April 21, Steinhoff and his team will ride 80 miles back, taking Card Sound Road to the eastern cities of Miami-Dade County, including Leisure City, Cutler and Olympia Heights. Upon their return to Florida International University, volunteers and spectators will cheer them across the finish line and present them with medals. The goal of the Zimmerman MS Bike Ride is to raise money to support research, programs and services to the more than 7,000 South Floridians affected by multiple sclerosis. Multiple sclerosis is an unpredictable, yet disabling, disease affecting the central nervous system, and it interrupts the flow of neurons between the brain and the body. There is no known cause and no known cure. “What started out as a fun cycling event has opened my eyes to the pain that MS can cause and the wonderful people in my own life who are moving forward with the disease,” Steinhoff said. In 2012, the Zimmerman MS Bike Ride raised nearly $1.4 million through corporate sponsorships and fundraising efforts of the cyclists, volunteers and donors. Steinhoff and his team have raised more than $2,000 to date. Waterfront Properties and Club Communities specializes in homes for sale in Jupiter, Tequesta, Stuart and other regions of Palm Beach and Martin counties. For information, call 561-746-7272.